Images like this make it impossible for me to believe that the universe isn't really dancing, to a music deeper and slower than anything our puny ears can detect. Anyway, it does move, as Signor Galilei reportedly muttered under his breath at the Inquisition, and if I want to think of that movement as dancing, I will. 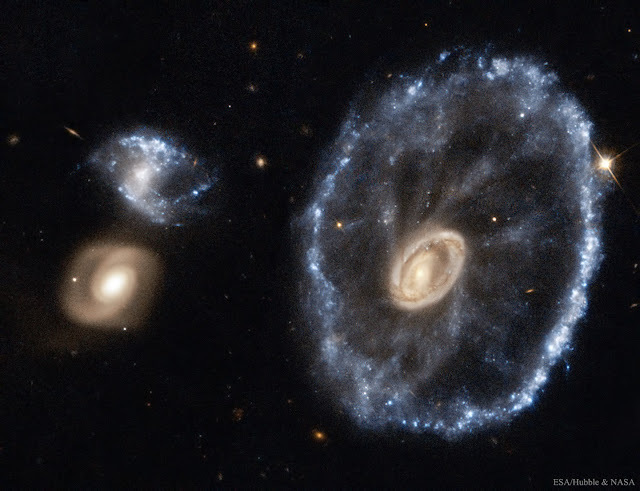 This is the Cartwheel Galaxy -- 100,000 light years across and 400 million light years away. Long ago one galaxy passed through another and what you see here are the ripples, like water in a pond when you've tossed a stone in.